The beginning of the trail follows a slightly graded dirt road. Generally, hiking up a road with lots of people isn’t my favorite type of hike, but it passes by climbing cliffs, a dam, and the small Longmont Reservoir which just look like a wide, slow moving portion of the North St. Vrain Creek which is also skirted by the road all within 3/4 of a mile. Here, there is a turn off to Sleepy Lion Trail which is an off-leash area for dogs. 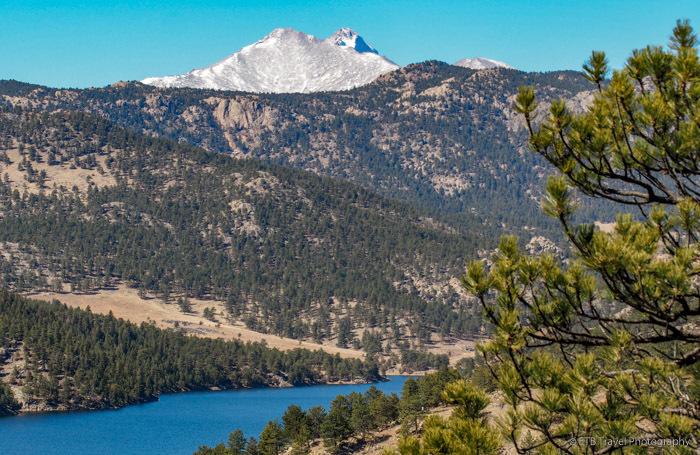 The single-track trail climbs through an evergreen forest, through a meadow, and to a handful of wonderful rock outcroppings with spectacular views of Ralph Price Reservoir and the snow capped 14er, Long’s Peak. Ernest and I took a little while to snack and enjoy the vista before we continued along the well marked trail which slowly widened to about a car width as it descended down the mountain to the base of the dam where water shoots into the creek. The sun shined on the spraying water creating rainbow colors which we admired before crossing to the service road and heading back to the parking lot. The hike was very easy, beginning around 6,000 and only gaining about 600 feet over the first two miles.